First Line: "You should've asked my opinion before you went off half-cocked," Kirstine MacBride-Derry scolded her half-sister Vicki from behind the counter of the wool and yarn shop they owned together on the outskirts of Glenkillen, a small village in the Scottish Highlands on the North Sea, along a protected bay called Moray Firth. It's all hands on deck for the Glenkillen sheep dog trials, which is the last big fundraiser for the local hospice. Although she can't exactly remember how, newcomer Eden Elliott volunteered her services and has been trying to avoid Isla Lindsey, the bossiest, most infuriating woman on the planet, ever since. 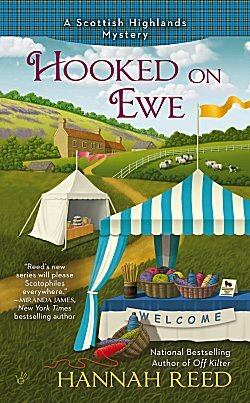 Having sent in the manuscript of her first romance novel, Eden would much rather help her friend Vicki in Sheepish Expressions, a shop co-owned by Vicki and her sister Kirstine. But there's no time to help distribute the first of Vicki's Skein-of-the-Month packages to subscribers once Isla's body is found. Isla was strangled with yarn from one of the Skein-of-the-Month packages, and as a newly created Special Constable, Eden feels she has the right and the responsibility to find Isla's killer. I really enjoy Hannah Reed's Scottish Highlands cozy series, particularly for the setting. In Hooked on Ewe, Reed gives us a good look at a staple in the Highlands: sheep dog trials. Having seen them myself in the beautiful little village of Luss, I appreciated Reed's description. We're also treated to a bit of knitting, and Eden climbs aboard a boat and goes out into the Moray Firth. The mystery is a good one, involving quite a chase around the suspect list, and Reed applies a strong dash of humor-- especially in the relationship between Inspector Jamieson and Constable Stevens. Jamieson prefers working solo, and since Stevens annoys the stuffing out of him, Jamieson is always dreaming up busy work for the constable to get him out of his hair. Constable Stevens is coming into his own a bit because he has a particularly funny scene all his own. There's an added bonus in this series. Since Eden is an aspiring author, readers are treated to some of the creative as well as the nuts-and-bolts publishing processes in writing. However, as much as I enjoyed Hooked on Ewe, I did have a few problems with it. First of all, I cannot believe that any police force in Scotland would agree to give someone special constable status when she's on a six-month tourist visa that's half over. I was also a bit puzzled over the motivations of the dead woman, but I can't say any more because I'd have to divulge too much of the plot. The third thing that bugged me was a point of geography, which won't bother readers who haven't traveled extensively in Scotland. I have, so when I read that a character's sister, who was returning to Glasgow from a holiday on the Isle of Skye, decided to swing past Glenkillen to pick up her Skein-of-the-Month package, it just didn't add up. People in the UK don't tend to drive long distances. If you had to pay what they do for gasoline, you'd understand why. The drive between Glasgow and Skye is long enough on its own-- and Glenkillen is in the exact opposite direction by more than just a few miles. I know. I'm being picky! Geography aside, I enjoy the mysteries and the characters in this series. I look forward to my next visit. Interesting... This is an author I'll admit I've not (yet) tried. But it sounds like a solid story. I know what you mean about those things that just don't add up for you, but still, I may give this a go. It's definitely worth doing, Margot.